(From second right) Abang Johari, Juma’ani, Awang Tengah, Abdul Karim and Dr Sim pay their last respects to Andrew. At right is Soon Koh. 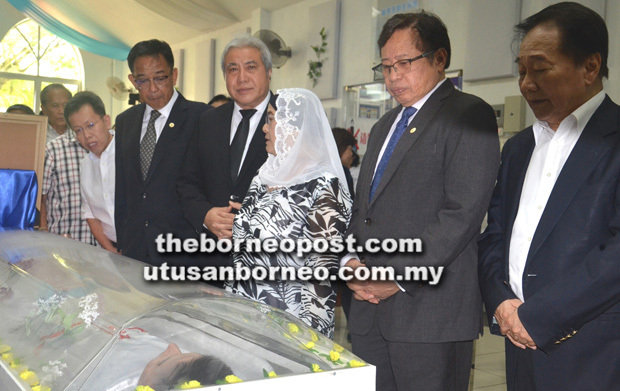 SIBU: Former deputy chairman of Sibu Municipal Council (SMC) the late Dato Andrew Wong Kee Yew is a role model for the youth, Chief Minister Datuk Patinggi Abang Johari Tun Openg said yesterday. He described Andrew as energetic and a man with vision and determination to modernise the society without losing the cultural heritage they had. “We have lost a very bright leader, particularly for Sibu. We know Andrew very well and he had contributed a lot in the field of education. “He was the one who initiated and set up the Laila Taib College and University College of Technology Sarawak. “He was very much concerned about the future direction of the state, particularly in Sibu development,” he told reporters when paying his last respects to Andrew at Nirvana Memorial Park here yesterday. Abang Johari was accompanied by his wife Datin Patinggi Datuk Amar Juma’ani Tuanku Bujang, Deputy Chief Minister Datuk Amar Awang Tengah Ali Hasan and his wife Datuk Dayang Morliah Awang Daud, and Minister of Tourism, Arts, Culture, Youth and Sports Datuk Abdul Karim Rahman Hamzah and his wife Datin Zuraini Abdul Jabbar. Others present were Local Government and Housing Minister Datuk Dr Sim Kui Hian, Assistant Minister of Transportation Datuk Dr Jerip Susil and his wife Datin Lee Chai Fong, former deputy chief minister Datuk Patinggi Tan Sri Dr George Chan Hong Nam and his wife Datuk Lorna Enan Muloon, Piasau assemblyman Datuk Sebastian Ting Chew Yew, Assistant Minister of Science and Technological Research Dr Annuar Rapaee and Tanjong Datu assemblywoman Datuk Amar Jamilah Anu. Also seen paying their last respects to Andrew were people’s representatives from DAP. The Chief Minister also mentioned that Andrew had big plans for Sibu. “When he was the deputy chairman of SMC, I had discussions with him on the direction of Sibu itself in terms of services as well as economy. “You know Sibu, the hinterland is along the Rajang River and he had an idea of developing Sibu together with the hinterland. “He agreed with me that we had to upgrade the infrastructure in the hinterland and rural areas,” he said. Abang Johari added that Andrew had visited a longhouse last week where he spent time with the people, which showed his concern and also his effort to transform what he had in mind. “I think the young generation should take a cue from what he had done. “What is important is that the younger generation should follow his footsteps, voluntarily helping people,” he added. Andrew, the only son of Second Finance Minister Dato Sri Wong Soon Koh and Datin Sri Pauline Leong, passed away on Sunday. He was found unconscious by his mother in his bedroom at their residence here at 9pm, and was pronounced dead about 11pm after medical personnel from two private medical centres here failed to resuscitate him. A post mortem showed Andrew had suffered bleeding in his left brain and stomach.